Welcome, friends! 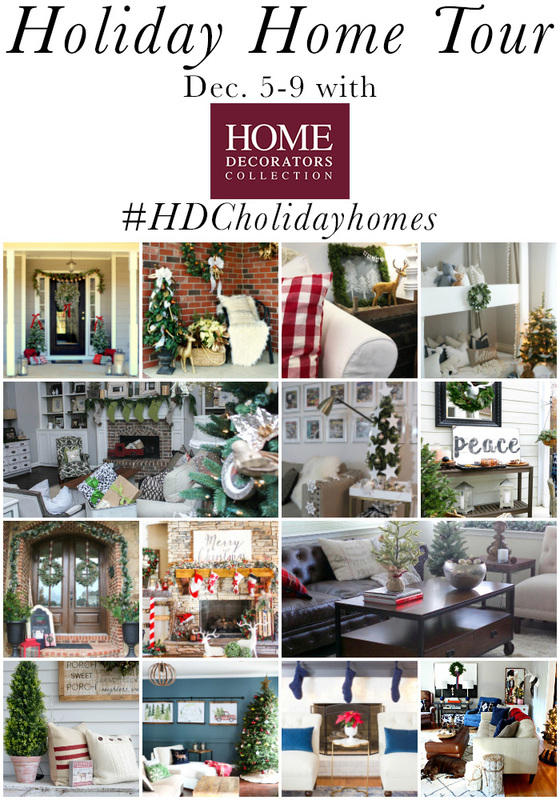 I’m excited and honored to be a part of the HDC Holiday Home Tour, sponsored by my friends at Home Decorators Collection®! I’m joining several other blogger friends to share some Christmas decor inspiration, and TWO of our lucky readers are going to win a $250 gift card from Home Decorators Collection®! Details are below, but first, welcome to my front porch! I went all-out this year with some gorgeous pre-lit wreaths and garland (and even some extra chalk art). Aren’t these wreaths fabulous? They’re the Martha Stewart Living™ Snowy Dunhill Fir Wreaths from Home Decorators Collection®, and you can find them by clicking here. They’re nice and full with plenty of faux berries and pine cones, plus just the right amount of glistening faux snow! And my favorite part? They’re pre-lit with 50 warm white LED lights that have a built-in battery-operated timer! They’ll stay on for 6 hours, off for 18, then back on again! Love that feature! As for the garland, I chose the Martha Stewart Living™ Glistening Pine Garland, also from Home Decorators Collection®, found here. It, too has the same great pre-lit feature with timer as well as plenty of pine cones and sparkling snow! I love how it frames our doorway perfectly! In my urns, I used my same old method of filling them with trimmings from our trees, but I also added some faux berries and picks I’ve collected over the years! Nothing too fancy or perfectly arranged, but still a great accessory for your front porch or entry! And if you know me at all, you know I have to have chalk art. I’m offering a free printable of this here! We welcome you and Scout welcomes you! I hope you’ll stop by on Saturday to see my indoor Christmas tour! And be sure to check out the other tours and enter the giveaway! Merry Christmas, friends! This entry was posted in Uncategorized and tagged Christmas, Curb Appeal, Decorating, Front Porch, Giveaway, Outdoor Decorating, Outdoor Inspiration, Sponsored Post. Bookmark the permalink. Follow any comments here with the RSS feed for this post. Post a comment or leave a trackback: Trackback URL. Love what you have picked. And your furry baby stole my heart. Thank you! He’s stolen mine too! Looks beautiful and so festive! A stunning front entry – love the greens and the touch of tartan. Just beautiful. Your entry looks just gorgeous! The wreaths are beautiful and everything works so well together!! Such a pretty entry, great choices! Your porch is so pretty! Very welcoming! Love it.